Next year 2019 they will be additionally local tax sejour .80 per euro per night per adult only e.g. 1, adult 7, nights 5.60 euros per week to be paid locally in cash. 20% Discount Brittany Ferries crossings when booking with us! Bookings for Bumpkin & Coach-house are Friday to Friday. Your holiday home will be yours from 5.00pm on the day of arrival and until 10.00 am on the day of departure. All bookings are subject to receipt of the completed booking form and deposit and are subject to our terms and conditions. We hope that the above information about La Mare Chappey, its accommodation, its wonderful surroundings, and its convenient location is of interest to you. Should you require any further details or wish to enquire about specific availability, please do not hesitate to contact us. We look forward to hearing from you - and to providing you with some of the best holiday accommodation in Normandy! We pride ourselves on being amongst the best child friendly and toddler friendly cottages in Normandy. 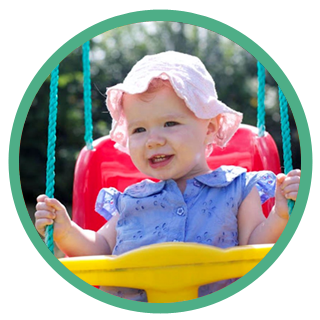 Our Cottages come equipped with a raft of high quality nursery equipment including cots, highchairs and child gates. We want to make your holiday at La Mare Chappey the best ever. If there’s anything else that would make it complete, just ask. Just a reminder....check in time is 5pm on the day of arrival and checkout time is 10am on day of departure. No cramming sheets into the car. Or being unable to put the dishwasher on. We hope that this makes a difference to our guests. The Swimming pool is open from mid May to the mid-end of September and heated by a pompe au chaleur which achieves temperatures from 25 to 28 degrees during the season. We realise that some people do not want to spend the end of their holiday cleaning ovens, shower rooms, floors, especially if you have an early departure time on changeover day. Please do give us a call us on 00 33 2 33 41 29 76 or contact us using the form here. What a great time we had, the playground, the swimming pool + the indoor play area were all favourites, especially the excitement with the bouncy castle! Thank you so much for a relaxing time. The Baker Family. London W18. Thank you for a fantastic holiday, two weeks in River Cottage. So great not to have to lug all the baby kit out with us – everything we could have possibly needed is here! All in all a brilliant set- up for families with small children. Jamie, jenny, Jemma Talia Summers (Surrey) Grandparents!